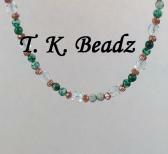 Welcome to T. K. Beadz Unique Handmade Jewelry. 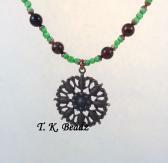 I create an eclectic array of jewelry. Mainly because of my hyperactive brain. I tend to get bored easily and chase many squirrels. Most pieces are one of a kind. If you have any questions, please contact me at tkbeadz@yahoo.com. You can visit my blog at www.scatteredbeadz.com or Facebook page at https://www.facebook.com/Scattered-Beadz or follow me on Twitter at https://twitter.com/ScatteredBeadz, Instagram at https://www.instagram.com/scatteredbeadz and Pinterest at https://www.pinterest.com/scatteredbeadz. And may God richly bless you.